Reading the Gabriel Allon backlist in reverse order, I note that the author, Daniel Silva, improved as he progressed. For clearly this early (#3 in publication sequence) Allon is a developmental piece where Silva is still working on the style that would later enliven such work as [b:The Fallen Angel|13390528|The Fallen Angel (Gabriel Allon, #12)|Daniel Silva|http://d.gr-assets.com/books/1334114823s/13390528.jpg|18621486]. 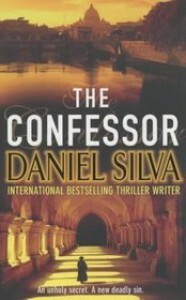 In [b:The Confessor|93801|The Confessor (Gabriel Allon, #3)|Daniel Silva|http://d.gr-assets.com/books/1341575498s/93801.jpg|2633218], Silva aims high and broad, in the all-encompassing scope and audacity of [b:The Da Vinci Code|968|The Da Vinci Code (Robert Langdon, #2)|Dan Brown|http://d.gr-assets.com/books/1303252999s/968.jpg|2982101], and in the wish-fulfilling formulation of the invincible, impervious and unerringly-accurate character of Allon, and his absurdly single-minded protagonist, the Leopard. In his later books, Silva painstakingly develops the situational framework and the key protagonists from strong formative foundations, such as the survivor of the Holocaust in [b:The Rembrandt Affair|7096123|The Rembrandt Affair (Gabriel Allon, #10)|Daniel Silva|http://d.gr-assets.com/books/1348557282s/7096123.jpg|7353253], hopefully taking a cue from writers such as John LeCarre. But in this early work, he plucks out of thin air, conjuring assassins and conspiracies from marginally established fiction. Somehow, this grandiose approach to the essentially solitary nature of ultimate spies reduces the gravity of the book, fills it with a frivolity that is hard to shake off even as Silva tries to turn serious towards the end of the narrative. I also remark that Silva's prose here is not as spare as his later work, sprinkled with inconsequential details and distracting asides. He spends a bit more time on his soapbox, touting the toughness of the Jews who must face enemies on all sides, a theme that Silva maintains in his future books albeit much subdued. This is the 6th Allon book I have read, and the earliest in publication sequence, and am perhaps all Allon-ed out. At the least, it's time to take a break from the singular worldview and see what else is going on with the rest of the mankind.